Just as I started high school in 1976, President Gerald R. Ford signed a proclamation declaring February as Black History Month because as he said, “the country needs to seize the opportunity to honor the too-often neglected accomplishments of Black Americans in every area of endeavor throughout our history.” He was certainly correct. As a young black man, I had limited knowledge of black history and even less exposure to black culture. I grew up in the small southwestern town of Los Alamos, New Mexico. If I had a nickel for every time in life I have heard, “I didn’t know black people lived there,” I would be a wealthy man. However, there was some truth to that statement; Los Alamos only had five black families living there when I grew up. Today, demographically, not much has changed. According to the U.S. Census Bureau, black people represent less than one half of a percent of the total population. Los Alamos is not known for its cultural diversity, despite New Mexico having the highest percentage of Hispanic and Latino Americans and the second highest percentage of Native Americans as a population proportion among the 50 states. Los Alamos is known as the birthplace of the atomic bomb. It was where the Manhattan Project was launched and it is home to Los Alamos National Laboratory (LANL), an elite, national scientific research community funded by the federal government. LANL is thought of as the place where all the “top secret,” confidential, undisclosed, classified information about our nation’s security and defense is kept. It was also the place that brought my parents to Los Alamos. My father, Robert L. Ratliff was a biochemist. He earned his doctorate degree from Saint Louis University during a time when segregation was still legal and widely practiced in St. Louis and many other American communities. He was recruited to work at LANL on genetic engineering and cloning, long before those terms were familiar to most of the American public. The lab he ran made significant contributions to genetic engineering: it was the first to successfully clone living tissue that was viable (frog eggs); he became famous for the manufacture of terminal transferase, a genetic glue, that allows scientists to add nucleotides and recombine bits of DNA. Its application led to the creation of synthetic human insulin which was a godsend for diabetics who were either allergic to the available swine-based insulin, or would not use it for religious reasons. Finally, his lab played a lead role in the ultimate mapping of the human genome, allowing modern day scientists, doctors and researchers limitless information about our DNA and how it relates to our health and longevity. My father’s academic and professional accomplishments were likely considered improbable to many but for me, they spoke to who he was, who many black people were and still are today – resilient, persistent and determined to achieve and be contributors to their communities. Martin Luther King’s leadership paved the way for all blacks to have the rights necessary to expand their ability to participate in and contribute to a stronger nation. In 1955 he supported Rosa Parks by leading the Montgomery bus boycott which lasted for 385 days! During this time King was arrested, his home was bombed and he was subjected to personal abuse and threats. Dr. King’s resilience, persistence and determination allowed this protest to conclude on December 20, 1956 with the US Supreme Court ruling that segregation on public buses was unconstitutional. When I think about Black History Month, I think about my father, Rosa Parks, Dr. King and “the accomplishments of black Americans in every area of endeavor throughout history” who as President Ford believed, have contributed significantly to strengthening our democracy and helping to create a more perfect union!! 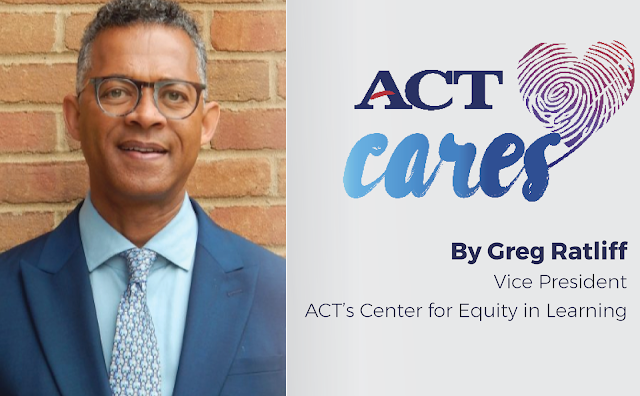 The work we’re doing at ACT, and particularly within ACT’s Center for Equity in Learning, to close gaps in equity, opportunity and achievement, propels us toward the goal of helping underserved students and workers find their fit and contribute their talents to our nation. I’m proud of the work we do every day to promote holistic, inclusive and transformational partnerships, products and services that help students navigate their unique journeys to success. Everyone, of every color, creed and background has a purpose in life, and our purpose is to help individuals find their path to achieve success. Success is as unique as a fingerprint—and so is the journey to achieve it. The My Success campaign was created to provide a community of support, stories and resources for lifelong learning, to encourage and inspire individuals navigating their journey to find success. Join our community of support and share your story of success by using #MyStoryMySuccess or visiting mysuccess.act.org.